Yes, it’s this terrible right now. I’m thinking of revising my stereo/navigation setup in the Matrix. Indulge as I go into the world of non-mainstream Android head units and sound deadening. Within my ups and downs, stereo setups have kind of been an avenue of relaxation for me, as I’m constantly trying to improve my driving experience. For instance, I recently changed the engine mounts, relieving the horrible clunking sounds and the frequent nausea problems involving my passengers. I also changed out the Sony head unit to a marine amp, which elicited interesting feedback from Oppo. 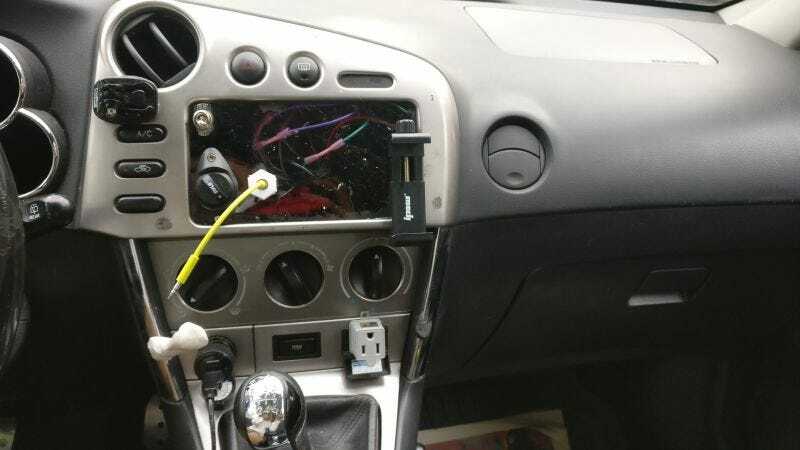 So...instead of making a convoluted Raspberry Pi or Arduino setup (like this awesome and glorious retro Celica stereo powered by an Arduino), I’m leaning toward a Joying 7' Double DIN Android 6.0 powered head unit, mostly because of its active modding/developer base on XDA Developers that allows me to connect a rear-facing dashcam to be used as a reverse/backup camera. I need to find my Mobius dash cam and that would be connected to this via a spliced USB cable. The Joying head unit looks not too shabby and will allow me to use Waze with the necessary phone integration bits. The head unit will come after the sound deadening, as the sound isn’t going to get any better without it. A head unit also means I will have a clock in the car. One issue that is plaguing this vehicle is the terrible sound deadening, which is worsened by the Yakima bike rack that’s on the roof. The door seals are basically shot by this time, and leak cold air/sound in a very annoying way. This doesn’t help with long road trips, and it doesn’t help with the increasing volume I push the stereo to at 70 mph to understand the podcast. The original factory stereo had a function where it would automatically increase the sound level as you drove faster.....I also can’t hear the speech of passengers in the rear seats at 60 mph. I plan to put sound deadening (with the cheapest square foot per dollar ratio) all around the vehicle to enhance the comfort of long-distance driving and inter-human communications. Down the line, I’d also like to put in new OEM door seals...but that also costs quite a bit. The driver’s seat has really bad lower back support and has been contributing to some recent back stiffness. I’m going to go to the local car junkyard and find a better seat. The A/C tends to seize up in 90 degree Fahrenheit weather. I need to get that figured out. I need to go to a Toyota dealership to figure out the Takata airbag recall (this needs to actually get done). I need to repolish my headlamps, and I’m following this guide loosely except for the UV sealant/inhibitor they are using. I also will be upgrading the 9006 bulbs I have right now to “9012" bulbs which are much better. It only takes 5 minutes with a small pair of pliers and you have a much more brighter bulb. I also need to tint my windows with the budget “pre-cut” templates as I don’t really want to spend several hundred dollars on a custom job. I also need to find the leak on the rear taillamps and caulk up the leaks. This will take time and money; but this will be an ongoing process to make highway driving into a more comfortable process.